Primo piano vacanze affitto con due grandi camere da letto e 1-1 / 2 bagni. Godetevi di essere nel centro di Bristol a fare passeggiate a banchine, negozi e ristoranti. Posizione perfetta per gli ospiti che vogliono esplorare New England, 1/2 ora a Newport o Providence e 1 ora a Boston o Cape Cod. Molto grande su 2000 metri quadrati di spazio vivente. Cucina completamente attrezzata con lavastoviglie e forno a microonde. Rondella e asciugatrice a pieno formato per l'utilizzo. La camera da letto anteriore ha due lettini. La camera da letto principale ha un letto matrimoniale. Soggiorno ha divano letto, divano e sedie a misura intera. Sala da pranzo posti a sedere 6 ospiti. La connessione internet wireless e la TV satellitare sono disponibili. 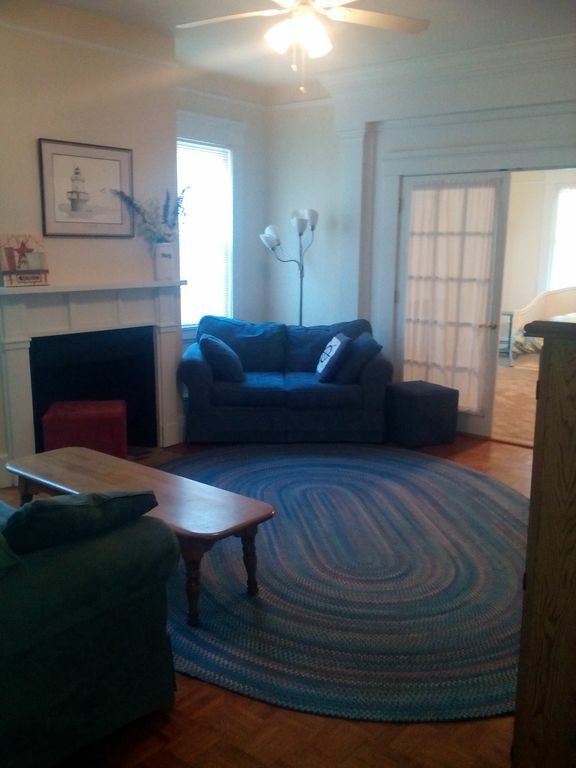 Great location with lots of space! Perfect for our visit with family nearby. The house was spotless and fully stocked. Beth was available for anything we needed. Amazing location: walk to coffee, breakfast, and waterfront playground. Bike rental and bike path access a few blocks away. The living room has generous, comfortable sofas and an entertainment center fully stocked with CDs. A large expandable table, book shelves loaded with books, games and puzzles were in the dining room. We spent a few really fun nights after dinner playing games. Just in case there is a chef in your party, there is a fully stocked kitchen with every imaginable utensil, pot and pan and large basket on the counter filled with snacks. I personally wanted to visit every restaurant in town -- yummmmmm! A large patio in the back yard with a gas grill, tables and chairs along with lighting was at the ready for our use. It was beautifully stocked with essentials coffee, sugar, snacks, linens, beach chairs, paper products and more. Turn back the time! Bristol, RI is a pre-Revolutionary War town in RI and is known for the longest running 4th of July Parade in the country. My visit to Bristol was the week before the parade and this little town was definitely the all-American, red-white-and-blue village of years gone by. The house at 18 Church Street was one block from the harbor (Narragansett Bay) and one block from the sweet town center – a very easy walk to charming shops, restaurants, and historic sites – an absolutely perfect location. It is about a 30-minute ride to Newport and Atlantic Ocean (South ) and Providence (North). Also, it is a day-trip away from Boston and NYC. I hope you can tell that I was more than happy with 18 Church Street. When I return next year (God willing), I expect that the work on the charming Victorian front porch will be completed and I can't wait to watch the town go by with a glass of wine from a rocking chair. Love having happy guests that enjoy staying at 18 Church Street. We try to update a little every year, this year focus is the front porch.